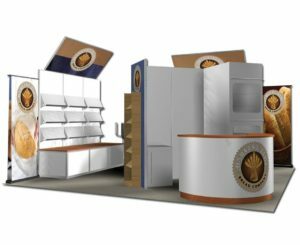 The designs and renderings we offer are customized to fit any brand or logo. See some of the examples below which can be mixed and matched with different features. 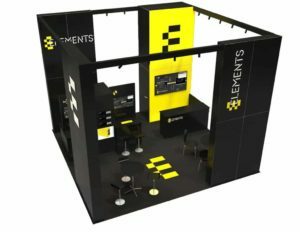 Our 20x20 trade show exhibit rental options don't end here though! Scroll through numerous options below to better calculate exactly what you're looking for, then contact our team to get a free design rendering of your own. 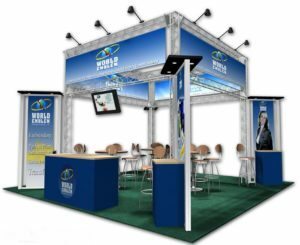 We provide our rental exhibits in Orlando area and all around the US. This next 20x20 exhibit offers an immense amount of options for the next show. It includes a single central pillar composed of multiple customized panel wall and stem lighting. 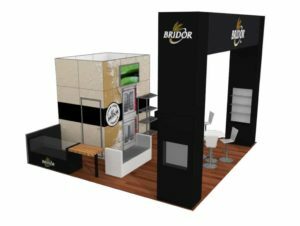 Additionally, the exhibit offers customized flooring options. Lastly, this exhibit has dual monitors facing both outward and inwards. 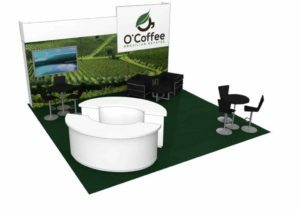 With this 20x20 exhibit layout your sure to draw attention with a ton of features. 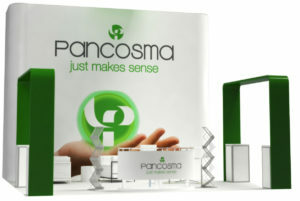 From the centralized custom panel wall, graphic hanging sign and multiple reception areas. Furthermore, this exhibit offers a duel seating area around the exhibit. Overall, a great use of spacing. 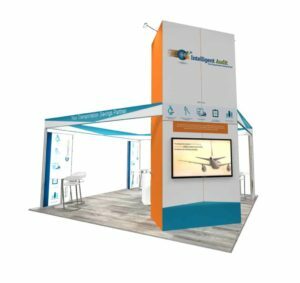 The next 20x20 exhibit offers very unique and customized features. 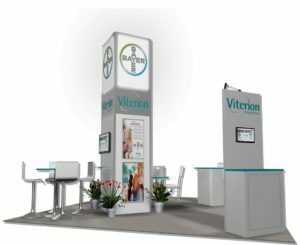 For this 20x20 exhibit, a circular reception area and large monitor draw in attention. Additionally, this layout offers ample meeting spaces and an open layout for easy mobility. As a 20x20 exhibit, this example contains all needed elements. From the display boxes, reception counters and walled sections with shelving. The exhibit also includes a large circular hanging sign to draw people in from afar. Lastly, the exhibit offers two middle glass display cases for products. With a more modern approach, this next 20x20 exhibit encapsulates the entire exhibit. With a display cased archway and hardwood flooring. This 20x20 also includes multiple meeting spaces and a storage area in the rear. Finally, this exhibit includes multiple display cases for your product. The next exhibit plays a heavy focus on open meeting spacing. 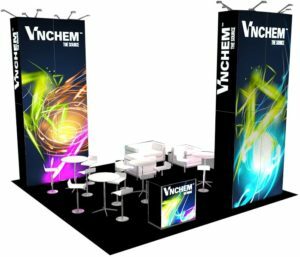 It features duel custom printed pillars in the front, along with custom graphic panel wall located in the rear. 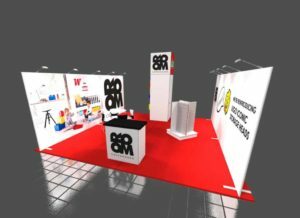 Furthermore, the exhibit offers an open spacing option in the middle and meeting spaces. 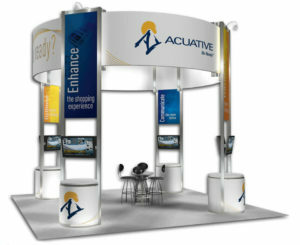 This next 20x20 exhibit offers a large customized archway and ample product shelving below. 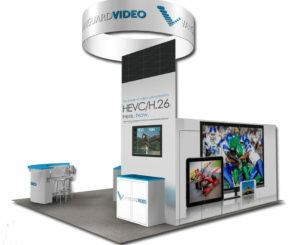 Along with this, the exhibit has two HD monitors to display products. Finally, the exhibit uses a hardwood flooring and offers meeting space in the front. With an art gallery feel to it, the next exhibit plays off a walkthrough layout. This layout includes duel high walls located on either side. It also has stem lighting located above both walls. 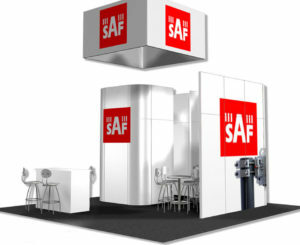 Additionally, the exhibit also offers frontal reception area and a standing rear pillar. When looking for an example of an industrial layout this example is great. With metal framing system, puck lighting, and four customized panel walls. This exhibit is sure to meet the expectations of the customer. Overall, the exhibit offers interior monitors, meeting spaces and reception areas. The next 20x20 exhibit layout provides a ton of paneling throughout the display. It features a panel based tower, panel overhangs, and countertops. The exhibit also provides an enclosed back room and frontal reception area and HD monitors. 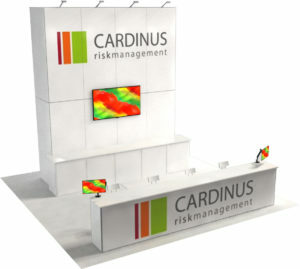 Overall, providing a unique exhibit layout through the use of panels. The next 20x20 example is key for a meeting space and client relations. With a focus on a large centralized meeting area. It includes multiple seating options and couches located within the exhibit. Finally, the exhibit offers dual graphics panel towers. For this next exhibit, the layout provides a ton of informational interaction. 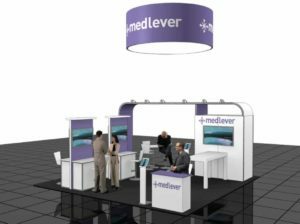 It features two interactive sitdown kiosk and dual HD monitors. 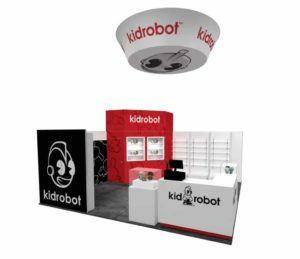 Also, the exhibit offers table spacing and custom printed logo's Furthermore, the exhibit also includes a large circular hanging sign and meeting spaces for clients. When looking for an example of an industrial exhibit this option is a prime example. With metal framing structure and multiple metal signage located. 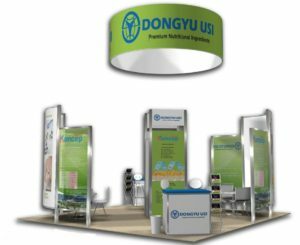 Additionally, this exhibit offers a large circular hanging sign and two meeting spaces. Finally, the exhibit offers multiple product stands located around the layout. 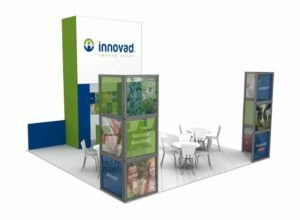 This exhibit is a great example of a panel wall option. With a large front desk area and back wall monitor. The exhibit includes a large multi-panel wall with stem lighting to highlight the product. Lastly, the exhibit provides duel outfacing monitors. With this next exhibit, the archways are established for added effect. 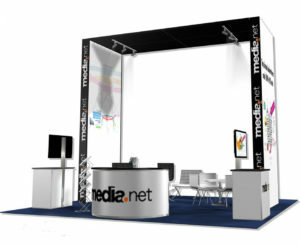 For this 20x20 exhibit, a reception area and product stand where essential for the layout. Lastly, the exhibit includes a large fabric backdrop for a seamless finish. With this next design, the focus was on an industrial layout and base. 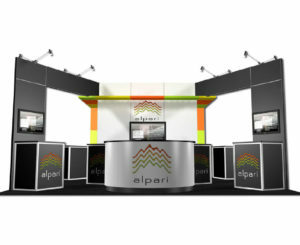 With metal framing outlining the exhibit and multiple monitors, this exhibit is a great 20x20. Additionally, the exhibit offers meeting space and four pedestals. This next exhibit has many elements of a good layout. 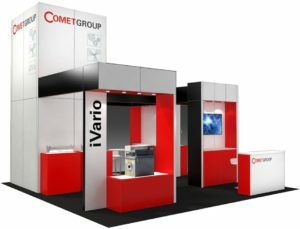 With a large central pillar incorporating custom signage and backlight tower. Finally, the exhibit includes the flowers to provide a natural landscape approach. 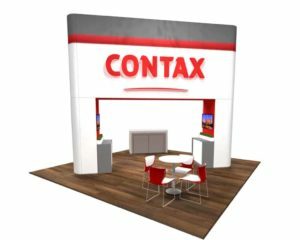 This next 20x20 exhibit offers customized shelving units as the main option. With a frontal reception area and customized signage options. Lastly, this exhibit offers storage options. 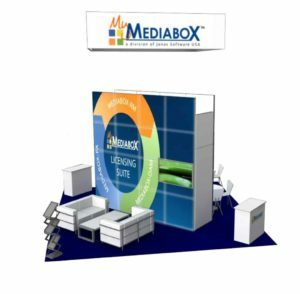 With this 20x20 exhibit, the design is centered on a customized panel graphic wall. 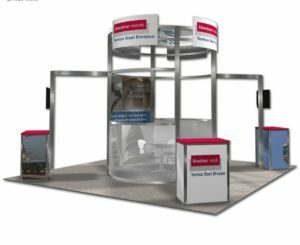 From enclosed meeting space and duel seating areas, this exhibit is a standout. The exhibit also includes a large hanging sign. For this next exhibit, the focus is on an industrial overhang structure. With a high metal framing and a large circle around the center. The 20x20 also includes meeting space in the middle and four outer facing monitors. With this exhibit, the focus is on an industrial design with extended elements. The metal framing and wrap around sign help make a key center point. The additional stem lighting around the exhibit help to highlight the exhibit. For this next exhibit, the exhibit faces outward. With the front side open and large reception area. The exhibit also includes custom printed otter graphics. Lastly, this exhibit also includes three monitors and panel wall background. With this next exhibit offering both storage and spacing was a key element. For a 20x20 the large circular hanging sign and high walls help draw in customers. Overall, the clean layout of the exhibit establishes a good brand.